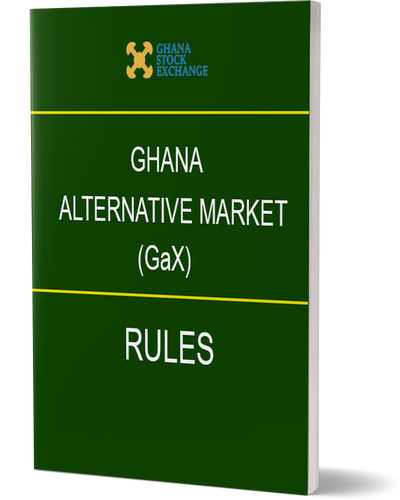 The Ghana Alternative Market (GAX) is a parallel market operated by the Ghana Stock Exchange. It focusses on businesses with potential for growth. The GAX accommodates’ companies at various stages of their development, including start-ups and existing enterprises, both small and medium. Listing on this market will afford companies the opportunity to secure longer term capital. The raising of such capital allows for future expansion, growth and greater ability to stand competition. Raising long term capital through GAX will be at a relatively lower cost to the company. Advisory and Regulatory fees involved will be lower than that of the main list on GSE. Securities and Exchange Commission guidelines insist on total cost not exceeding 5% of the total amount to be raised. The listing fees on GAX is also a fixed flat amount. An immediate benefit enjoyed by a GAX listed company is the considerable improvement in its overall financial position. The injection of substantial equity funds, for example, greatly improves the company’s balance sheet. With such capital reinforcement and market discipline imposed, improved profitability and efficiency are expected. Listing on the GAX will raise the level of the investing community’s awareness of the company and its products. This will result for example in a greater ability to attract high caliber employees and increase general business opportunities. Owners of companies can also benefit from the realization of value of their investments when listed on GAX. The market will determine the value of the company and hence original owners can realize the value of their equity in their company. The GAX will also enable the companies broaden their investor base and provide liquidity for their shareholders/investors. Mandatory underwriting of the minimum offer directly or indirectly by sponsor. So there will be no failures of Initial Public Offers. Access to a revolving fund to support the cost of raising capital and deferment of up-front fees. Companies listing on GAX can apply for funds under the GAX-SME listing support fund to pay fully or partly for the cost of advisory services. A company applying to list on the GAX must have a minimum stated capital of GH¢250,000 at the time of listing. The stated capital of GH¢250,000 shall be the capital after the company’s initial public offer but prior to listing. The public float of the applicant must constitute a minimum of twenty-five percent (25%) of the total number of issued shares. The minimum number of public shareholders shall be twenty (20). Admission may be granted to a start-up company, provided the applicant submits to the GAX a 3-year business plan, demonstrating clearly the viability of the applicant. The company seeking admission to the GAX need not have recorded profits historically but must have the potential to make profit at least at the end of its third year of listing. Licensed Dealing Members, Investment Advisors or Issuing Houses shall sponsor an application for listing on the GAX.